With so much innovation in the development of new electric heating products, you can be forgiven for being somewhat exasperated by the vast array of heating choices available to you – especially if you're not sure what you need and why. But fear not – help is at hand! By the end of this short guide to electric heating, you will have all the information you need to make an informed decision. Radiators store heat and are ideal for prolonged everyday use. Convection heaters don't store heat and are ideal for occasional use. 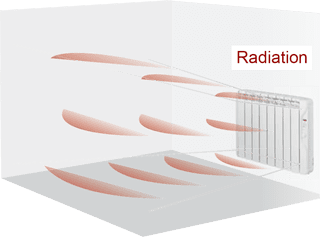 Whilst there is a clear technical distinction between radiated and convected heat, in reality an "electric radiator" uses a combination of radiated and convected heat (it heats circulating air to some degree) and can be described as a "radiator" or "heater". Confusingly, some electric panel heaters may also be described as a radiator, where "radiator" is being used as a synonym for "heater" (much like people use "hoover" in place of the generic "vacuum cleaner"). 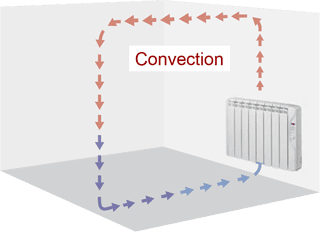 Nevertheless, the crucial distinction is this: a heater that does not contain a heating-retaining medium, such as thermal fluid or ceramic to store heat, cannot be accurately described as a radiator. Okay, okay, enough with the technical details already – just tell me what heater I should choose! Well, it all depends on the room and how you intend to use it. The economic choice of electric radiator or electric panel heater for your room mostly comes down to deciding if the room is for everyday or occasional use. Because electric radiators store heat, they are ideal for use as the primary source in those rooms you use every day and for prolonged periods of time (e.g. living room or bedroom). Electric panel heaters, by contrast, are ideal for those rooms used only very occasionally (e.g. guest bedroom or conservatory) and that do not require the continual heating an electric radiator would provide. In terms of upfront and running costs, electric radiators are cheaper to run but cost more upfront, whereas electric panel heaters are cheaper upfront but cost more to run. This is because electric panel heaters don't store heat, and so continually draw upon the power supply whilst they heat the air. By contrast, electric radiators require power only whilst they are heating up the storage medium. If you're using a room almost continually, it makes sense that the heat is radiated from a store and that you get the most use of the heat you've paid to collect there; whereas if you use a room only very occasionally, you want to heat the room only whilst you're occupying it, and you don't want to pay to collect heat to be radiated into the room long after you've left it. We hope this article on the technical, practical and economic differences between electric radiators and electric panel heaters has helped you determine your needs and make the best choice for your home heating project. If you need any further advice or assistance, please don't hesitate to call us on 01473 276686 or contact us via our contact form.